Annotation: Spectrum(R) Grade Specific for Grade 3 includes focused practice for reading, language arts, and math mastery. 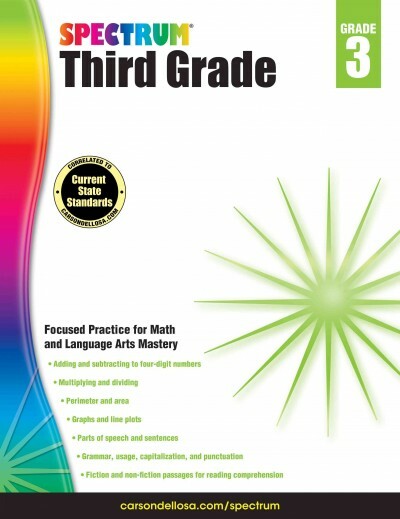 Skills include parts of speech and sentences, grammar and usage, capitalization and punctuation, adding and subtracting to four-digit numbers, multiplying and dividing, fractions, perimeter and area, and graphs and line plots.Each Spectrum Grade Specific workbook includes a writer's guide and step-by-step instructions, helping children with planning, drafting, revising, proofreading, and sharing writing. Children in grades 1 to 6 will find lessons and exercises that help them progress through increasingly difficult subject matter. Aligned to current state standards, Spectrum is your child's path to language arts and math mastery.